Each of the 25 winning poems in the Sue C. Boynton Poetry Contest is illustrated with flair and care by one of four artists. The resulting placards are displayed in Whatcom Transportation Authority buses for a full year. As a cartoonist and natural science illustrator, I like to blend my passions together into both nonfiction and science fiction comics. My focus is the natural world: the plants and animals we can see and interact with, or at least potentially interact with. It is not surprising that I focus on nature. I have always been surrounded by animals. Two weeks before I was born, my parents’ borzoi, Domino, birthed a litter. They were so busy raising me, they never really got around to selling the puppies as intended. Then with my brother coming along, we all moved out to the country. They bought a house (it came with a cow!) and quickly filled the land with horses, a pony, chickens, turkeys, and other animals. Even without the added domestic animals, I was playing with frogs and raising the tadpoles from our pond. And I was drawing and writing and reading. And I am still drawing, writing, and reading. I draw comics, which you can get on Storeenvy, and paint nature, which you can get on mugs and pillows from Society 6. And I am reading—researching Maria Sibylla Merian and the late 1600s in preparation for a graphic novel biography. You can follow my research on Patreon. I have a sci-fi comic on tumblr and an autobio comic on tumblr. My general social media (twitter, tumblr, Instagram) is angelabcomics, and my personal website is angelaboyle.flyingdodostudio.com, which has links to everything, including many more comics. Photo Copyright Abe Olson. I once told my husband that making art was not an option, it was a need. I have to make art, I have to use my hands. I believe in craftsmanship. I research every single one of my ideas, draw several sketches, collect images, words and doodles. I throw out several ideas and save what I think are the very best ones. As an artist I collaborate with those around me, seeking feedback and critique. My illustrations have a minimalist style that leans heavily on mark making. I love strong lines that create a visual impact using simple repetitive shapes. I would describe myself as a mixed media artist as my current works are digital, surface and pattern design, illustration, fabric, and clay. I received my BFA from Emily Carr University in Vancouver, BC, and I have made my home in Bellingham for the last 6 years. You can buy my prints, including the ones inspired by the poems in this contest, on Society6, or my handmade goods at Scrappy Carp Living on Etsy. I like to tell stories with art. I love garish and fantastical characters. I enjoy human beings and my art explores stories of human emotion as well as my passion for costumes, colors, textures, and intriguing environments. Growing up on the coast of Maine, I was surrounded by stories and images of the region’s folklore. Seilkies, Mermaids, Ghosts, and Pirates were all believably real entities to me. My childhood fascination with monsters and supernatural beings continues and influences the way I choose to portray people. I also have a need to express with my art. I become inspired, and have worked hard to train myself to go into a sort of a trance that allows what’s inside to come out. It’s only later that I can look with any objectivity on something that I’ve created and perhaps get a glimpse of what I was feeling or thinking. It is akin to the way one might analyze a dream. I may start a painting or puppet with a certain image in mind, but I allow the original image to change or even get completely painted over whenever I start to see new things. I am often quite confused about how I am feeling until after I paint, draw, or build things and the truth comes to the surface. This is the way I best communicate with myself. In this way I suppose nearly all my paintings are also portraits of my life. Thank you for your interest in my work. I hope that the world I have created sparks your own imagination and provokes many hours of daydream in the years to come. is a paper cutting, rainbow loving, poetry flowing mother and teacher. Originally from Northern California, she made her way to Bellingham seven years ago and never passes a mountain, lake, flower, or tree, without a deep breath and an appreciation for its beauty. A self-taught artist, she has always been enamored with the color and texture of paper and collage. She employs a wide array of colored papers, scissors, scalpels, knives, and glue, and uses them in conjunction with details and patience. She runs the Natural Learning Center in Bellingham and loves to share her joy of art and words with the children she works with. Also known as K. Wulfe, more of her work can be seen on Facebook at K. Wulfe and followed on Instagram @kimwulfy. Does Angela the sci fi comic have a WP blog? Angela replies: I have a sci-fi comic at imitatusanima.tumblr.com. I also have an autobio comic at inkycomics.tumblr.com. My general social media (twitter, tumblr, Instagram) is angelabcomics. And my personal website is angelaboyle.flyingdodostudio.com, which has links to everything, including many more comics. I appreciate the tremendous amount of work you put into this blog. A lot. This is my second request that you please consider using a larger font for your bus poem reproductions so that they are readable. As they stand, no one can read them, not even the young eyes of students, so all the kudos you pour on yourself for making poetry available to bus riders comes off as just another example of liberal hypocrisy – all talk, no game. The bus company probably has graphic guidelines to help you choose the right font and image sizes to be effective. Thanks, Jesse. 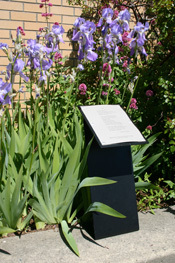 As it is, the contest limits the line length and the number of lines so that the poems fit on the plaques and placards. To make the font larger, those two measures would need to be cut down drastically. We’ll definitely pass along your comment to the Boynton committee.